It is absolutely critical that landlords keep the roofs on their commercial buildings properly maintained and in good repair. If this is not done on a regular basis, water problems could result in structural damage to the building as well as to the inventory and equipment inside, it could also pose a safety hazard to the employees. A regular maintenance and inspection schedule should be set up to make sure that the commercial roofs for a business are kept in good repair, by doing this the roof’s life will be extended considerably and it will ensure that the building as well as the contents inside are well protected. The entire roofing system needs to be inspected. This includes the masonry, gutters, drains, and flashing. Roof inspections should always be documented and any roofing problems or repair issues should be photographed. 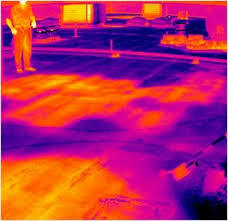 Thermal Imaging helps to identify leak and moisture problems in the roofing system and should be done as part of the inspection process. Why are so many roof systems left to deteriorate? Is it, out of sight, out of mind? At Roofing & Waterproofing Ltd our objective is to create ‘peace of mind’ for our clients, to maximise the service life of their building’s roof, while maintaining a hassle free environment for the internal use of the building. Extend the service life of your roof. Remove damage causing debris from the roof. Reduce the risk of costly damage to the building interior and contents. Much greater risk of premature failure. Creates additional, unnecessary building expense. Causes an endless supply of possibilities for interior damage. Waste natural energy resources due to lack of insulating properties. Like any piece of equipment, your roof is only going to perform if you take care of it. Let’s face it – most people don’t spend much time on their roofs, and it’s easy to let small problems turn into much larger issues. ROOFING & WATERPROOFING LTD roof technicians are industry experts and are able to diagnose and solve just about any roof related problem you may have. We service ANY and ALL roof types!